Sega has long held a stranglehold on the Vocaloid music game market with their Project Diva series. Now, to challenge Hatsune Miku’s dominance comes IA and her game IA/VT -Colorful-. As a music game, the most important aspect of the game is its soundtrack. Like in the Project Diva titles, the music in IA/VT is licensed fan-made music made using the Vocaloid music composition program. Of course, instead of using Hatsune Miku and her friends as the singing voice, those in this game use IA instead. As this is the first game featuring IA, the game’s soundtrack is incredibly strong. Sixty of her best songs make up the core game with more being added as DLC. The worst I can say about the musical selection is that some songs aren’t as amazing as others—but there isn’t a single song in the game I downright dislike. The gameplay itself is rather easy to grasp, though more than a bit difficult to master. Each song has two play modes that alternate during each song. 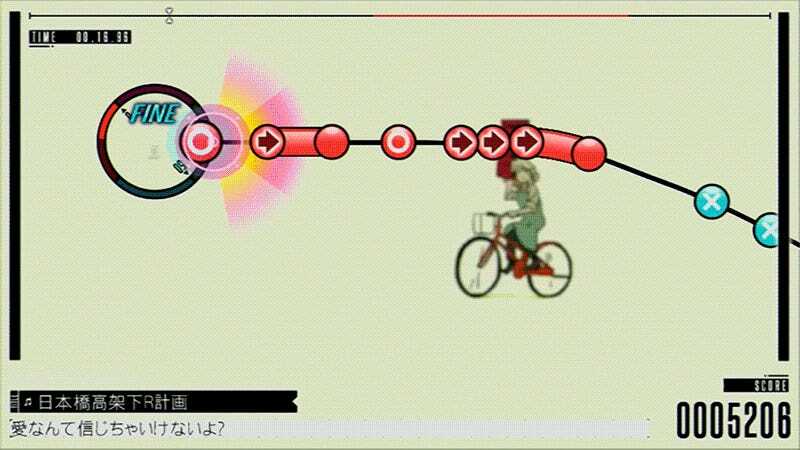 In the normal mode, notes corresponding to the buttons on your controller float along a line that begins off screen. When each note reaches the circle at the end of the line, you press the correct button. However, it rarely stays that simple. Much of the time there are several lines connecting to the circle at once, each having its own series of notes floating along it. Sometimes, the lines move as well, either rotating around the circle or changing shape. At certain points in the song you reach “colorful” mode. When this happens the circle expands and the notes appear from within the circle and fly outward. When one crosses the circle boundary, you press the corresponding button. Each song has three difficulties—with the major change being the number of buttons you use in each song. For easy you use four buttons, six for normal, and eight for hard. In the higher difficulties, the game can get more than a little chaotic and hard to keep up with. And by the time I unlocked all 60 songs, my thumbs actually hurt. Unlocking the songs is actually the worst designed (and most monotonous) part of IA/VT. In most music games, when you clear a song for the first time, it unlocks another song. In IA/VT, songs unlock based on your player level instead. Each time you pass a song, you get a certain number of points based on your letter grade and the difficulty of the song. As you get more of these points you level up. However, you only get these points the first time you achieve a grade on any given song. In other words, the first time you get an A grade on a song you receive points, all other times you get an A, you get nothing. If you get an S rank, however, you receive a few hundred extra points. All this added several hours to the game where I was forced to replay the songs I didn’t particularly want to replay on a difficulty too easy for me simply because it was the most efficient way to unlock new songs. Outside of the main “Free Play” mode of the game where the songs are all unlocked, there is the “Step Up Play” mode. While not adding to your level, step up mode picks a song and gives it special objectives for you to complete as you play—like get a 100+ combo or an A rank. Beyond that, there isn’t much besides an online leaderboard to look at. The rewards for playing the main game and step up mode basically come in the form of costumes—and sometimes new interface graphics. The game has an insane amount of costumes to unlock as you play. However, only about a fourth of the songs in the game use a character model dancer—and can thus use the different costumes. Most of the songs just have pre-made music videos running in the background instead. IA/VT is a solid first step for a Miku-rivaling music game series. It succeeds in the most important areas with its great game play interface and an astounding soundtrack. On the other hand, it is missing many of the extras (song creators, Miku’s room, etc.) from the Project Diva games and the song unlock process makes playing a chore at times. Still, if you are a Project Diva fan, you owe it to yourself to give IA/VT a try. 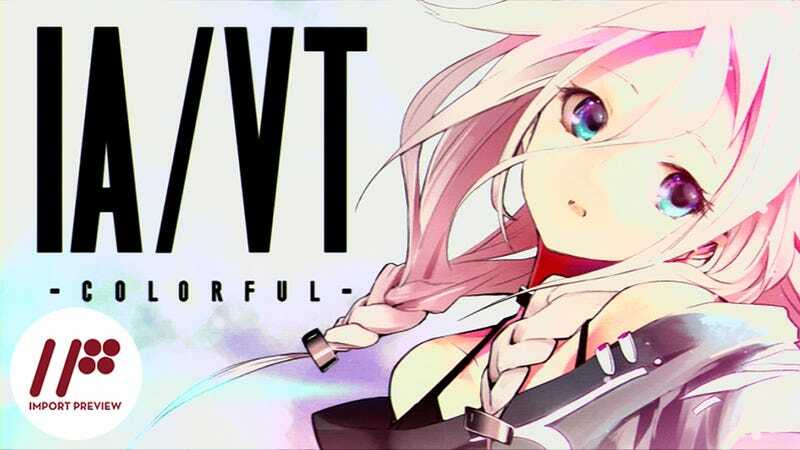 IA/VT -Colorful- was released for the PlayStation Vita in Japan on July 30, 2015. There is currently no word on a Western release.